A Slice of Smith Life: Solar Eclipse Experiment and Burning Chocolate! We are continuing our Astronomy lessons using Apologia text and we are enjoying learning so much about our amazing solar system! Last week we finished up our lessons on the sun and we learned more about a solar eclipse using a flashlight, an inflated globe and a Styrofoam ball. We did this little experiment at night with the help of my husband. I think our kids and their friend liked making shadow puppets while learning about the solar eclipse too! 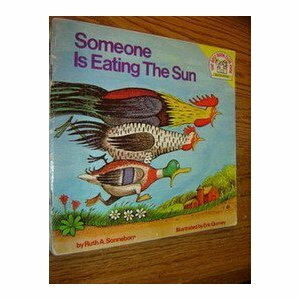 A cute book that I read to my children about the solar eclipse is this one, Someone is Eating the Sun. The main character, Hen, tells all her animal friends that the sky is getting darker because someone has taken a bite out of the sun. This is a humorous story and my children enjoyed the animals' reactions to what they were experiencing, a solar eclipse. It's a new month and a new opportunity to join in and link up to the No Ordinary Blog Hop (NOBH) that I co-host with 6 other bloggers. Just click on the button below to find out more information and start linking up your posts. We have several categories to make linking up easier and hopping more fun! Great science! I hope I remember that eclipse one. It's a great way to explain it to them in a way that they will understand and remember. Thanks for sharing what you and your cupcakes are doing. Great ideas and projects for me to do with my son. You and Anna-Marie have made this subject so interesting for your children. Thanks again. Such great ideas! And chocolate! What great experiments! My kids and I would love to do the chocolate one. Thanks for hosting at NOBH. I'm now following your blog. Neat experiments! We've used the sun to burn a hole in a leaf. It's pretty amazing!